The Trace Sunday school is progressing nicely. A large crowd attended Sunday. 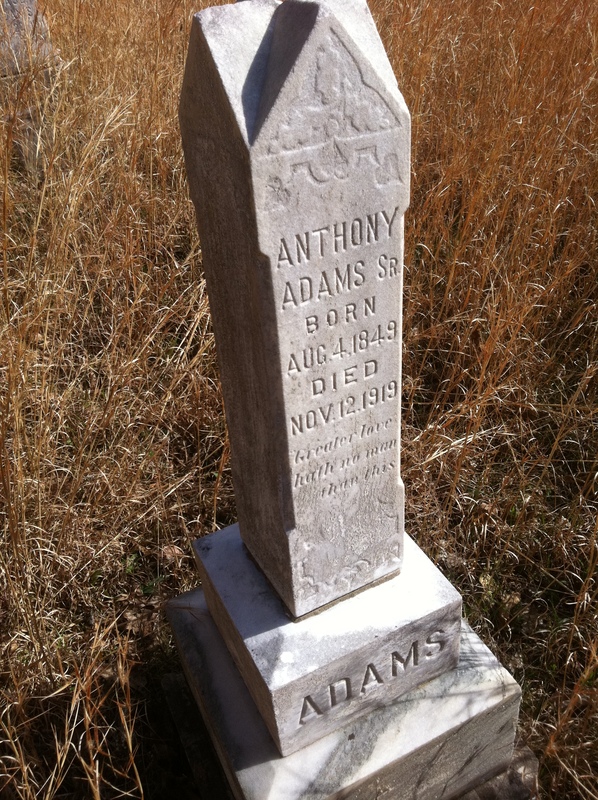 Anthony Adams of Logan was visiting relatives on Harts Creek Saturday. Viola Adams, daughter of Mr. and Mrs. Johnnie Adams, died of appendicitis Monday. Funeral services were held at the Mullins cemetery. Burl Adams of Chapmanville was visiting relatives on Harts Creek Sunday. Cole Baisden made a business trip to Logan Monday. Rev. I.M. Nelson and R.G. Short are going to hold a revival at the Christian church on Trace, beginning January 16. R.L. Dingess of Whirlwind spent Saturday with his parents at Queen’s Ridge. Some of the daily acts: Grover and his dogs; Phillip collecting the news; Charley and his kodak; Pearly looking for Burl; Carl cold trailing and Clinton carrying the news. Howard Adams was seen going through town Saturday. Guess he was out on business. Elias Workman has been on the sick list for the past two weeks. Edward Hensley, the prohibitionist, and Frank Adams, the constable, are constantly on their duty trying to catch all the moonshiners at present. Anthony Adams of Logan visited relatives at Whirlwind Sunday. Mr. and Mrs. R.L. Dingess of Whirlwind spent Sunday with their parents at Queens Ridge. A large crowd visited the Hoover school house Sunday expecting to hear a sermon delivered by Rev. Chas. Curry, but were badly disappointed as Curry was not present. Daniel McCloud has postponed his singing school, as there are several pupils suffering with smallpox at the place where the school is being taught. T.H. Adams went through town with a basket in his hand Sunday. Burl Mullins of Buck Creek spent Sunday on Hoover with his sweetie. Wilburn Mullins of Mud Fork is still visiting Hoover regularly. Charley Mullins made a business trip to Twelve Pole Monday. Mr. and Mrs. Ewell Mullins made a flying trip to Washington, D.C., last week. Guess they had a message for the President. Carl Adams is still cold trailing. Carl says he is going to stop if the trail doesn’t get warmer. Isom Workman was calling on Miss Lucy B. Mullins Sunday. Miss Lucy B. McCloud of Hoover was visiting her aunt, Mrs. Lora B. Martin, of Queens Ridge Sunday. 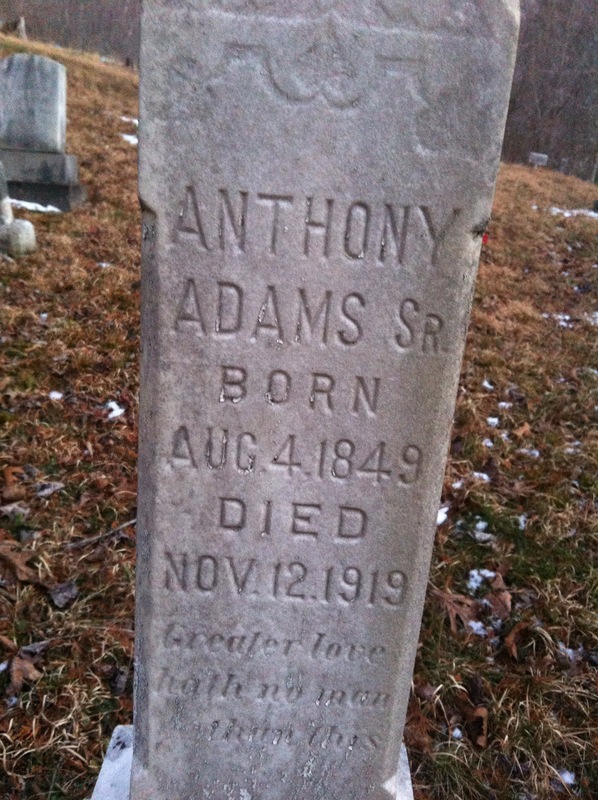 Yesterday, I revisited Anthony Adams’ grave at the mouth of Buck Fork of Harts Creek in Logan County, WV. When the gang reached the headwaters of Trace Fork — what John called “Adams territory” — they sent a rider out ahead in the darkness to make sure it was safe to travel through that vicinity. Waiting on the Brumfield posse was a mob of about 100 men hiding behind trees at Sycamore Bottom, just below the mouth of Trace Fork. This mob was led by Ben and Anthony Adams and was primarily made up of family members or people who worked timber for the Adamses, like Tom Maggard (“Ben’s right hand man”). As the Brumfield rider approached their location, they began to click their Winchester rifles — making them “crack like firewood.” Hearing this, the rider turned back up Trace Fork, where he met the Brumfields and Dingesses at Boardtree Bottom and warned them about the danger at the mouth of Trace. They detoured safely up Buck Fork, then stopped at Hugh Dingess’ on Smokehouse where they remained for two or three days, not really sure of what to do with their prisoners. They made a “fortress” at Hugh’s by gathering about 100 men around them, fully aware that Ben Adams might make another effort to recapture Milt and Green. While at Hugh’s, they got drunk on some of the red whiskey and apple brandy made at nearby Henderson’s. They also held a “trial” to see if Milt and Green would admit their guilt. They took one of the men outside and made him listen through the cracks between the logs of the house as his partner confessed on the inside. About then, the guy outside got loose and ran toward Bill’s Branch but was grabbed by “Short Harve” Dingess as he tried to scurry over a fence. After this confession, the Brumfields and Dingesses considered killing Milt and Green on the spot but “got scared the Adamses was gonna take them” and headed towards Green Shoal. John didn’t know why they chose George Fry’s home but figured Mr. Fry was a trusted acquaintance. He said they “punished” them “quite a bit there” but also got one to play a fiddle. A neighbor took their bodies through Low Gap and buried them on West Fork. This “quick trial,” of course, didn’t resolve the feud. 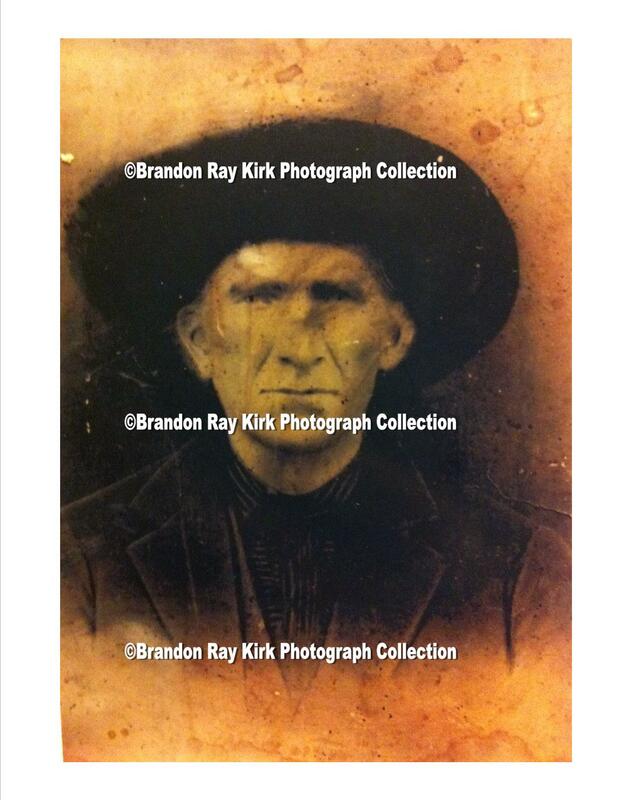 Back on Harts Creek, Ben Adams often had to hide in the woods from the Dingesses. One time, Hugh and Charlie Dingess put kerosene-dowsed cornstalks on his porch and set them on fire, hoping to drive him out of his house where they could shoot him. When they realized he wasn’t home, they extinguished the fire because they didn’t want to harm his wife and children. Mrs. Adams didn’t live long after the feud. Ben eventually moved to Trace Fork where he lived the rest of his life. Charlie never spoke to him again. John also said there seemed to have been a “curse” on the men who participated in the killing of Haley and McCoy. He said Albert Dingess’ “tongue dropped out,” Al Brumfield “was blind for years before he died,” and Charlie Dingess “died of lung cancer.” We had heard similar tales from Johnny Farley and Billy Adkins, who said mob members Burl Farley and Fed Adkins both had their faces eaten away by cancer. Vilas Adams told us about one of the vigilantes drowning (Will Adkins), while we also knew about the murders of Paris Brumfield, John Brumfield, Charley Brumfield, and Bill Brumfield. Just before hanging up with John, Brandon asked if he remembered Ed Haley. John said he used to see him during his younger days on Harts Creek. John said Ed made peace with a lot of the men who’d participated in his father’s killing and was particularly good friends with Cecil Brumfield, a grandson of Paris.